Watercourses can be natural (streams and rivers) or manmade (drains and canals). 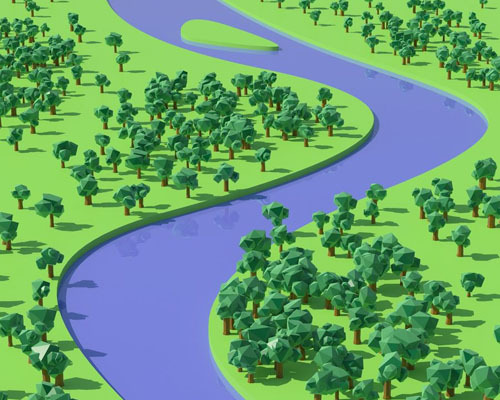 Rivers usually begin as small mountain or hill streams where steep gradients produce fast flowing water conditions where loose rocks and stones are formed by continuous erosion. Pebbles and gravel accumulate in places but vegetation is scarce or non-existent. Most streams are tributaries of rivers. Once the river reaches flatter lowland areas, water flow decreases, sediment is deposited and vegetation becomes increasingly frequent. The lower reaches of rivers are tidal where conditions are heavily influenced by tides and fluctuating levels of salinity. Reedbeds are present in places along the fringes of the river muddy banks are exposed at low tide. Drains are man-made excavations that were created to drain water from reclaimed agricultural land. They can be very useful habitats for a wide range of plants, insects, amphibians and fish. • Streams and rivers are greatly impacted by activities on land such as industrial, domestic and agricultural emissions. Pollution can originate from point sources such as pipes and drains or diffuse sources that may include nutrient seepage from excessive use of fertiliser. Great care should be taken to prevent fertilisers, herbicides and pesticides reaching watercourses and adequate buffer zones of at least 3 metres alongside rivers and 2 metres alongside streams should be rigidly applied. • Tree cover on river banks provides shade for fish and is itself an important habitat for many invertebrates, birds and mammals. It is important however to prevent tree cover from completely shading the river as this can greatly inhibit the growth of aquatic vegetation. Streams and rivers are vitally important habitats for a range of plant and animal life. The presence of insects such as stonefly and mayfly larvae is a strong indication of good water quality. These insects in turn form a major part of the diet of young Atlantic Salmon, Sea Trout, Brown Trout, Eels and even birds such as the Dipper. Fish are preyed upon by Kingfishers and Otters. Every section of a stream and river is capable of sustaining life provided that it remains unpolluted or damaged by drainage.